The bicycling community around the world is mourning the passing of Charles "Chuck" Harris, who died on Saturday, August 18, 2012 at the age of 76. Chuck Harris is best known in the bicycling community for the popular bicycle mirrors that he made by hand out of recycled materials. He was a welcome and loved fixture for many years at the Tour of the Scioto River Valley, Great Ohio Bicycle Adventure, and other events throughout the region. According to the obituary from the Mount Vernon News, a gathering to remember and celebrate Chuck's life will be held this Saturday, August 25, 2012 at 3:00pm at the Apple Ridge Shelter House-Sharon Woods Metro Park in Westerville, Ohio. We extend our heartfelt condolences to Chuck's family, and join them and our fellow cyclists in remembering his life and legacy. I loved seeing him every year at GOBA and TOSRV. What a wonderful, unique, colorful, kind, and helpful man! My condolences to his family. I was so sorry to hear of his passing. 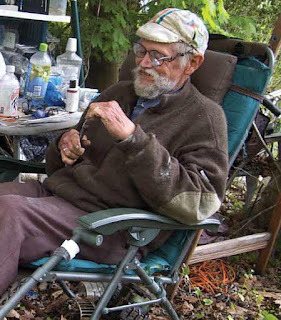 He was a fixture in our community and he made the best bicycle mirrors I've ever owned!